1. 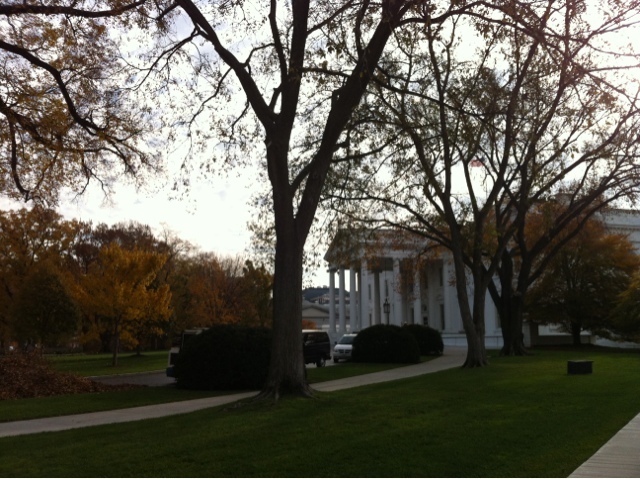 I went to the White House today, it never stops being cool. 2. I wish I could get the time back that commuting costs me. I wish I could fix dinner while I was on the metro. 3. I have heard from two people in the last two days who found our blog and have similar situations (one able bodied spouse or partner and one disabled). You are a big part of why we lay our junk out there. Thanks for contacting us! 4. My nephew's birthday is Friday. Why are all nephew cards super lame? 5. I had writer's block today. My usual cures, Matchbox 20 and a latte' helped. Phew! 6. I am eager to see our families for the Holidays, can't wait to get some solid plans set! 7. I wish my eyebrows would wax themselves. I don't have time to deal with them! 8. I am headed back to Iowa on Friday. I am looking forward to a few days on the campaign trail, but I will miss my Michael. I may or may not have been having political withdrawals. 9. I love people (especially in the customer service profession) who speak English. I love you. 10. I wish I was a better blogger and that I wasn't literally phoning this post in. Maybe I will do better tomorrow. That's how I found your blog too! My boyfriend was in a bad wreck in July and since then the Internet has been my information source! Heather, thanks for your comment! I checked out your blogs, too. Looks like you and Colin have lots of adventures, good for you guys! Let's keep in touch! And even though your blog followers may or may not comment on a regular basis, be assured we're here, we're reading, we're loving you guys, and we're so thankful that you both take time to share your lives here! Keep 'em coming! Will keep in touch! I have subscribed to your blog so I get e-mails as you update!